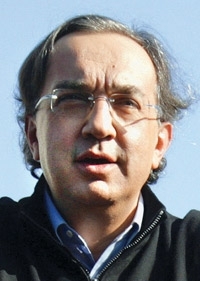 Fiat CEO Sergio Marchionne envisions a global auto empire. Only Toyota would be larger. General Motors' planned sale of Opel/Vauxhall in Europe pits Fiat against supplier giant Magna International. GM is looking to sell a share of its core European operations as part of its restructuring. Fiat CEO Sergio Marchionne has said he plans to create the world's second-largest automaker by merging Fiat's automotive operations with the new Chrysler emerging from Chapter 11 and with Opel, Vauxhall, Saab and GM's Latin American operations. In 2008, those units, including Fiat, had combined sales of 6.69 million units, trailing only Toyota Motor Corp.'s 8.97 million. "We want to create a real European group which can be successful all over the world," Marchionne told Germany's Bild daily newspaper. "The automotive business of Fiat fits together very well with Opel and Chrysler." But Magna, which has manufacturing operations in Austria, so far has presented a more concrete proposal than Fiat, Opel Supervisory Board member Armin Schild told Reuters last week. "Magna wants a financial investment with other investors in a holding company," Schild said. Media reports have said that possible partners for Magna include Russia's second-largest carmaker, GAZ, as well as Russia's Sberbank, a major player in Russia's banking industry. GAZ and its owner, billionaire Oleg Deripaska, repeatedly have denied interest.